Delete or rename logo_pb.bik and logo_thqnordic.bik. FXAA and SMAA, or T2x variants of these options. Frame rate is capped at 122 FPS. See High frame rate. Open ELEX.exe with a hex editor such as HxD. Find bytes 2B 43 48 3B C8 76 08. Change to 2B 43 48 3B C8 EB 08. Change only the first found byte sequence. In-game keyboard and mouse settings. Several keys (Z, X, T, Space Bar, others) locked from editing. X-axis inversion available as well. HUD automatically switches based on last input, causing HUD flickering if both controller and KB/M are used at the same time. Error creating thumbnail: convert: Expected 8192 bytes; found 8151 bytes `/tmp/localcopy_7dd9b7b480eb.png' @ warning/png.c/MagickPNGWarningHandler/1654. convert: Read Exception `/tmp/localcopy_7dd9b7b480eb.png' @ error/png.c/MagickPNGErrorHandler/1628. convert: no images defined `/tmp/transform_b8bbd99837ec.png' @ error/convert.c/ConvertImageCommand/3258. Main, Voice, Environment, Effects, and Music. Using Steam or GOG Galaxy, the language can be changed via the game properties. When not using GOG Galaxy, or if voices and subtitles should be in a different language, see the fix below. Open ConfigDefault.xml with an editor like Notepad. Change VoiceLanguage="English" and/or SubtitleLanguage="English" to a supported language. 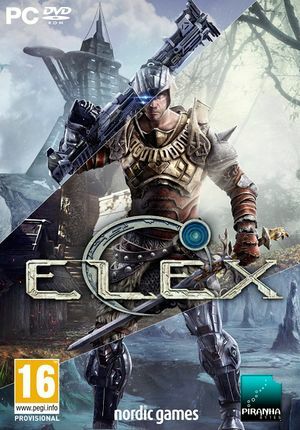 See ELEX 3DV-Ready Fix by MX-2 V1.20. Go to %LOCALAPPDATA%\ELEX\ and create a SaveGames folder there. ↑ 1.0 1.1 File/folder structure within this directory reflects the path(s) listed for Windows and/or Steam game data (use Wine regedit to access Windows registry paths). Games with Steam Cloud support may store data in ~/.steam/steam/userdata/<user-id>/411300/ in addition to or instead of this directory. The app ID (411300) may differ in some cases. Treat backslashes as forward slashes. See the glossary page for details.